I tried to visit the UFT blog, Edwize, this morning, and was redirected to UFT.org. Evidently UFT has thrown in the towel on the whole blogging thing. 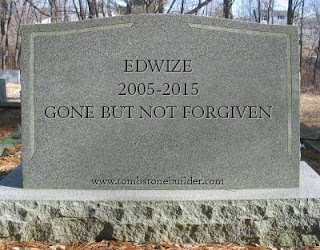 Here's this blog's first commentary on Edwize from August 20th, 2005. Thanks to School of Blog for the heads-up. This could be a good place to turn for contract updates, or perhaps debunking of anti-union, anti-teacher nonsense propogated by the News, the Post, and yes, the Times. You'll find it at EdWize. Or use the handy link in the blogroll on your right hand side. In fact I was contemplating writing for Edwize and dumping this blog, as I'd previously written repeatedly for NY Teacher. But alas, that was not to be. I read the details of the 2005 contract and very quickly made the acquaintance of folks like Norm Scott and James Eterno. I shared their horror at its details and Edwize was no longer interested in the likes of me. I received the following anonymous comment from a Unity loyalist. Unfortunately for them, the topics here are not controlled by the autocratic Unity-UFT management. Nonetheless, it's interesting to see why they're unable to respond substantively on Edwize. You are a bitter old curmudgeon that has nothing better to do than complain. While name-calling may pass for argument on junior-high playgrounds, it's hardly a substitute for reasonable discourse. We do live in a democracy. But that doesn't give you the right to yell fire in a movie theater just because you don’t like the movie. This, apparently, is Unity's most powerful argument. I know this because I've seen it used repeatedly on Edwize. While they imply criticizing Unity is the same as yelling fire in a movie theater, this point boils down to "Shut up." Nor does it give you the right to defecate relentlessly, anytime or any place you feel like it, at least not without consequences. That's interesting. Our commenter, no longer content with mere invective, has chosen to emphasize the point (shut up) by resorting to the scatological. While some may consider this juvenile approach colorful, it's hardly a substitute for argument. What you advocate is not democracy, but anarchy. It's interesting that Unity supporters, who've changed the UFT constitution specifically to preclude democratic election (so the high school teachers couldn't select a non-Unity VP) regard calls to elect new leadership "anarchy." This, again, is baseless name-calling. Democracies have rule of law and order. They do indeed. Too bad Unity won't allow high school teachers the right to choose their own leadership. Too bad Randi won't allow the CCs to select UFT workers anymore. It speaks volumes of Unity's interpretation of democracy. And most importantly, a sense of decorum. That's code, again, for "Shut up." I think your biggest problem is that you aren’t on meds, and you need to be, desperately. The highly prized "sense of decorum," seems to apply only to others, not this commenter. If that's the best retort they can dream up, it's no wonder the censors at Edwize need to work overtime. You shouldn't be teaching children in that condition. The commenter suggests criticizing Unity is tantamount to insanity. What on earth could this person be thinking? Why, oh why would anyone criticize my cozy little double-pension patronage mill? They should enjoy working more hours for, effectively, less pay. More interesting still is the commenter's implicit assumption that I treat my young students in the same manner as corrupt, ineffectual, self-serving adults. One can only hope this poster does not treat kids with the same "decorum" shown here.